Today I am hosting a Mini Challenge for the Once Upon a Read-a-Thon! I hope you are all having a fabulous time reading! I have one simple question for you to answer. and then come back and post your link in the comment section. 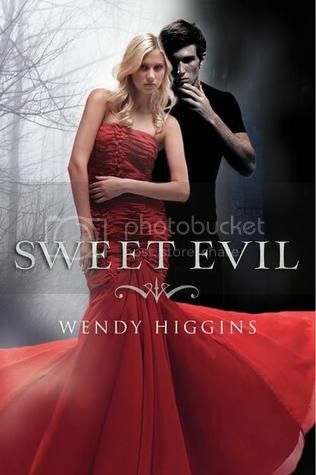 One (1) winner will receive a copy of Sweet Evil from The Book Depository! Winner will be randomly chosen, and must respond within 24 hours. Good luck guys, and Happy Reading! Just did the challenge on Twitter (: Thanks for the giveaway too! Here's My Mini Challenge Post! Thanks for hosting this Christy! My most anticipated book of 2012? Easy- Days of Blood and Starlight by Laini Taylor. The first book in the series (Daughter of Smoke and Bone) was hands down the best book I read last year. Thank you for this great question. I posted my answer under my day 2 post. Okay, I love this question... Here's the link to today's read-a-thon post, including my challenge answer! I posted my answer on Facebook. Great question. Thanks for the giveaway. Shadow of Night by Deborah Harkness! Great question! You can find my answer here on my Once Upon a Readathon update post. Thanks for the giveaway, too! I've heard fantastic things about that book. Here's my most anticipated book of 2012! Here's my answer post! I can't wait for The Casual Vacancy by J.K. Rowling. Thanks for hosting this! It's been so much fun! This was a hard challenge since there are so many great 2012 books that have already released and have yet to come out. Great challenge!! Here's my answer! Great Challenge!! Here's my answer!! Oh, dear. So many good books! I think mine is CARNIVAL OF SOULS by Melissa Marr. I've loved all her books so far and am really looking forward to a departure from her Wicked Lovely world. Love this question! My answer is here! AH, such a tough challenge. Took me forever to figure it out because there's so many to look forward to. Here's mine. Thank you so much for this awesome giveaway!! I SO hope to win. Look near the bottom of the page. You can find my book at the bottom of this post. This is an awesome question but it was hard for me to pick just one book! There's just too many great ones coming out to choose from lol. Oooooh, nice choice! That one's on my Wishlist!! Looks like my comment didn't get through. I picked For Darkness Shows the Stars! Also posted it here on Twitter. Great question and simple too. I enjoyed your challenge. Awesome question. Here's my pick! Having a bit of an Internet issue today so I hope it is okay if I just answer in the comments . I was really looking forward to the release of "The Reckoning" by Alma Katsu. Great question and I loved hearing everyone's choices....more books for my list!!! Thanks and Happy Reading! Yeah there are a lot of great books coming out. Scroll to the very bottom as I just did one post for the whole read-a-thon. The book I was most looking forward to this year is The Savage Grace by Bree Despain. Funny story, though. It's been out for awhile and I still haven't read it. Heh. I *am* still really looking forward to it, though. Thanks for an easy challenge! This was such a tough challenge but I had to choose shine by Jeri Smith-Ready. :) Thank you for hosting!! I'm not going to do this one since I have this book, but thank you so much for hosting a challenge! I posted the answer on my blog, under Wednesday's Updates here. I most look forward to Kelly Thompson's The Girl Who Would Be King. Here is what bookI can't wait for! I tweeted mine. Thank you! I am dying for Cinda Williams Chima's The Crimson Crown and the release of the first chapter just about killed me for the reat of the book.